Our diamond polishing pads are an economic choice while providing good quality performance. They are available in a grit range of 50 to 3000. Available for both wet and dry polishing of marble and granite. Order individually or in sets. 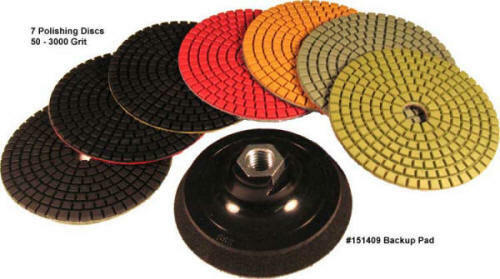 Our #151409 backup pads fits tools with a 5/8-11 arbor and it has the water injection holes. The diamond polishing pads attach to the backup pad by a strong hook & loop (H&L) connection. Wet polishing pads require cooling water.